Markets:Forex, Stocks, Futures, Commodities, Tresury Bond. Trade only in trend Gann hilo activator, It is the trend indicator for the direction of the trade. When appears a pattern: Inside Bar, Outside bar or Double inside bar, entry at open next bar. Fix the target 10-15 pips above the closing of the bar pattern,, if the trend is up. Fix the target 10-15 pips below the closing of the bar pattern, if the trend is down. For Daily Trading fix the target 20-30 pips. On picture below 8 pattern, 8 trades: 6 wins, 2 loss. This Trading System is also a Scalping Strategy with stop loss 10-15 pips. Share your opinion, can help everyone to understand the Binary strategy. Gann Hilo Activator Forex indicator : This trend following indicator helps finding both: entries and exits. 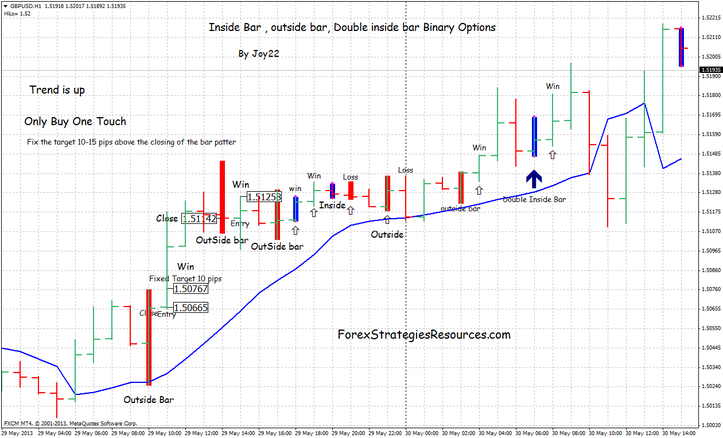 Binary options Trading System:One Touch Strategy: is based on the pattern: Inside Bar, Out Side bar, Double inside bar.